In each of our past issues we have published at least 4 haiku, which were always accompanied with relevant pictures (this combination of pictures and short poems can also be called haiga). For winter 2014 issue, we wish to publish more, on the condition that we receive enough good haiku. The top 4 will be published as haigas, while the rest depending on their numbers will appear on one or more decorated pages similar to the one you see below. 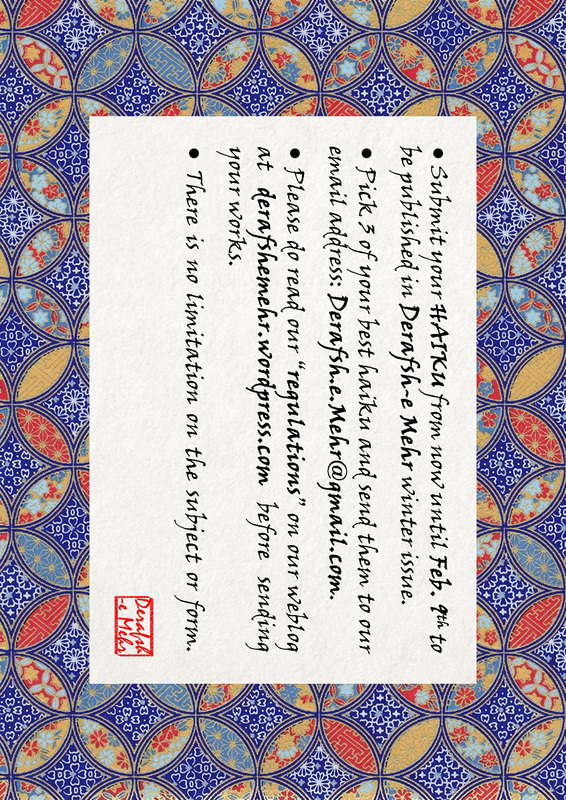 If you write haiku and wish to have them published in Derafsh-e Mehr upcoming issue, please pick 3 of them and send them to our email address (Derafsh.e.Mehr@gmail.com), with a short description about yourself (reading Regulations page is suggested) by February 9th (Bahman 20th). We will read your works and choose the best of them to be published in our winter 2014 issue. The haiku do not necessarily have to follow the traditional rules of Japanese haiku, including the 17 syllabic (morae) rhythm, or having a kigo, and etc. It is better to type your haiku in a single word document and attach it to your email when you send it. And please do not send us PDF files, because we won’t be able to use them. The same as all other works we receive for publishing, we have the privilege to edit your works before publishing them. This entry was posted on Sunday, January 26th, 2014 at 7:25 PM	and tagged with Announcement, Haiku, Issue #4, Winter 2014 and posted in Issue Winter-Spring 2014, News. You can follow any responses to this entry through the RSS 2.0 feed.